Honda two wheelers is going to launch a new Honda Aviator very soon! The new Aviator will be loaded with 110cc engine housing more power. 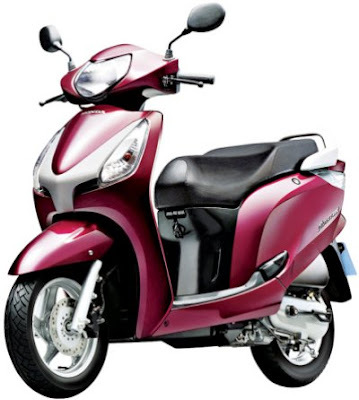 Earlier, the company has launched Honda Activa with upgraded engine and some extra features. In the same way, the Aviator will have 110cc mill and combi brakes. The new Honda Aviator is expected to be introduced in two variants- Honda Aviator and Honda Aviator Deluxe. It might be available in Monsoon Gray, Rebel Red, Berry Purple, Space Silver and Pearl Igneous Black. Front disc brake version of Aviator is already there in the market. This gearless scooter is believed to be priced around Rs 47160/- that would be Rs 6,000 higher than the existing model of Aviator. Honda Activa 110cc mill belts out 8bhp of maximum power at 7500rpm and 9Nm of top torque at 5500rpm. In addition to this, it is to come with body colour grab bars and key shutter system. Royal Enfield is going to launch it's New version Royal Enfield Bullet Classic. Hero Honda's Hero Honda Hunk is a popular bike in premimum segment in Indian Market.